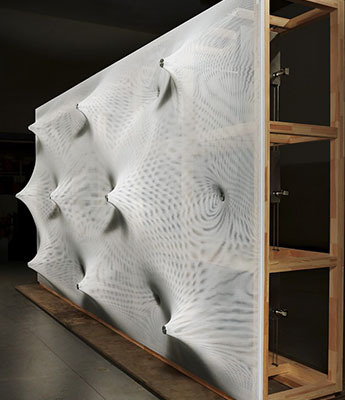 Architecture elements, such as a kinetic wall, can add intrigue to any architectural project. Architect Rem Koolhaas’ “Elements of Architecture” show opened at the Venice Biennale’s 14th International Architecture Exhibition. The show covers nothing less than architecture’s evolution from homo erectus’ first man-made fire to heating fixtures of the future, focusing on the plainer architecture elements: ceilings unnoticed overhead; corridors too quickly bypassed; those overlooked conveyances, elevators. It isolates each element so the viewer can feel it’s powerful, psychological dimension. This year, at Rem Koolhaas’ Elements Exhibition, one fascinating element is the Kinetic Wall designed by Barkow Leibinger. Barkow Leibinger is an American / German architectural practice based in Berlin and founded in 1993. Their research-based approach to design allows the work to respond to advancing knowledge and technology. 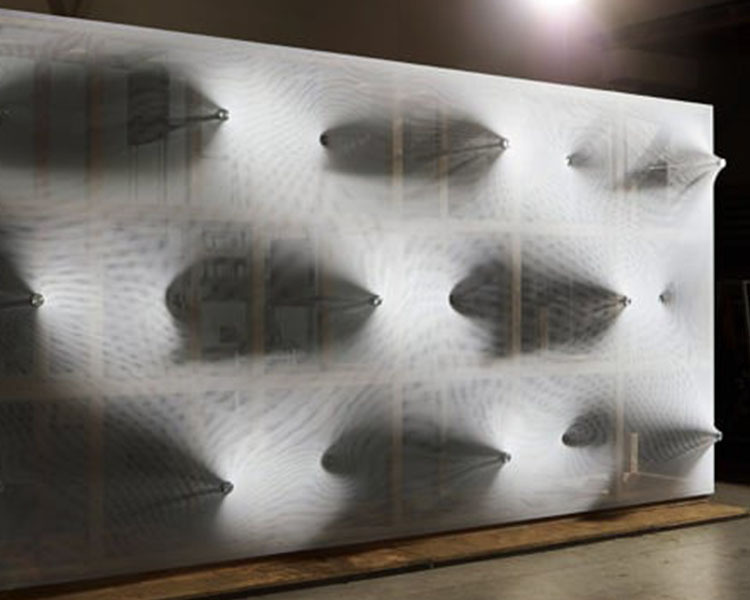 With the Kinetic Wall, Barkow Leibinger have created a shape-shifting wall that appears to breathe in and out. For years architects have looked for ways to design moving architecture. In this vertical example Barkow Leibinger revisited “the utopian dream of an architecture that can move”. They have created an ever-changing surface that rhythmically expands and contracts. 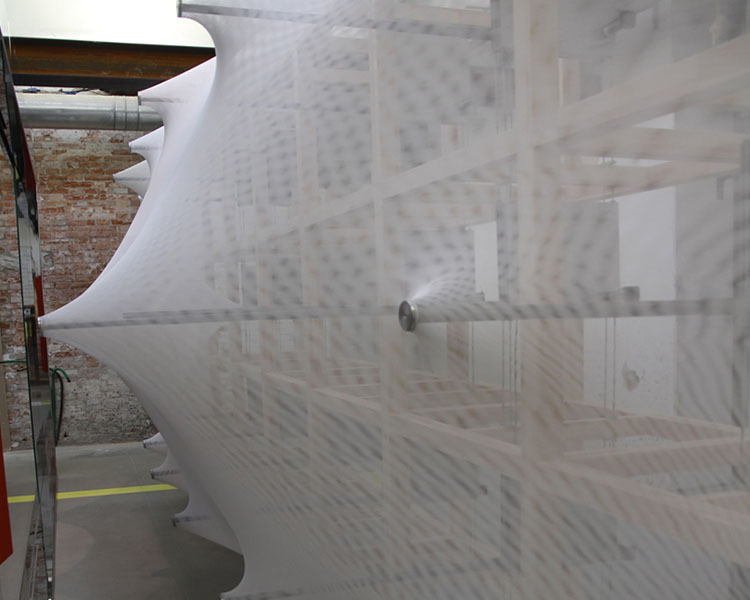 The surface is activated by a grid of motorized nodes, masked behind translucent layers of synthetic fabric. The nodes are programmed to move in and out periodically to produce what can be described as undulating peaks and valleys. The material used for the Kinetic Wall is elastic. It has a sheen which adds to the movement as the layers of fabric shift in and out of the light. The surface is supported by a frame that contains the mechanized architecture elements in a vertical plenum. The lightweight framework is a laminated timber scaffold, to which the fabric is attached. The negative thing about the wall is that this plenum makes the wall have to be thicker than any wall currently used in the construction profession. It would be great if the motorized nodes could be redesigned as smaller elements. At the Koolhaas’ exhibition the wall is displayed in a room which also puts on display the design process and history of the wall design. The presentation analyzes the changing roles of the different architecture elements and components. In addition to creating architecture that moves, Barkow Leibinger have designed something which can define future architecture elements. It is both materially and spatially dynamic, made of both natural and synthetic / recycled materials. To help demonstrate how the wall works, the Kinetic Wall was set up across from three types of walls; a mud wall from an adobe hut, a contemporary Japanese partition and a sliding glass door system. This allows the exhibition visitors to experience how the Kinetic Wall acts to alter the proportions of the space in front of it. As the wall activates it limits and changes the width of the passage ensuring an immediate, intimate, and corporal relationship. It allows the viewer to experience the architecture on more than just a physical level. The digitally controlled choreography enables endless surface patterns, which emerge slowly then recede and change. The surface material mentioned above further enhances the effect, a second scale of movement that is translucent and ephemeral. Certainly very cool if a bit impractical because of the wall’s thickness.